Many people can't distinguish between honeybees, bumblebees, and yellow jackets. It's a bummer for the bees, because yellow jackets are nasty little things. Bees-- honey, bumble or otherwise-- are, on the other hand, fuzzy, cute, and hardworking. The honeybee, seen below, collects pollen from flowers for honey. The chubby bumblebee also collects flower nectar for honey, although she produces far less than her petite cousin. Do the bees inadvertently pollinate? Or do they have a deal worked out with the flowers? The yellow jacket, sleek, hairless, and yellow-faced, is a predator. She lives in a dusty nest made from wood, not wax. She will happily eat the rest of last week's pulled pork sandwich from the dumpster. No flowers for this girl. As you can obviously see from this anatomically and politically correct diagram, yellow jackets are more yellow than honeybees, and at least this one bumblebee. (Many bumblebees are more yellowy than this one.) They have these creepy, dangly, yellow legs that create the impression of a skulking hunter. 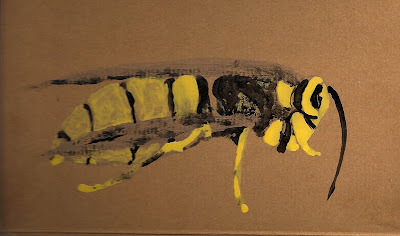 Yellow jackets are aggressive, and their sting registers a 2.0 on the sting scale, described as "W.C. Fields extinguishing a cigar on your tongue." Most people who have been stung by a yellow-and-black insect have most likely been stung by a yellow jacket. So back off the bees! I have also fallen victim to the yellow jacket! You can have my pulled pork sandwich as long as you keep your distance!